Documenting urban nature in the City Nature Challenge. CalNat is teaming up with the UC Davis School of Education's Center for Community and Citizen Science, UC Davis Evolution and Ecology Department, & others to put the Sacramento region in the City Nature Challenge competition for the first time. Learn more information about how to join the fun in this article. April Newsletter: Are you Ready for the City Nature Challenge? 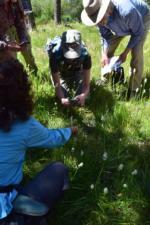 News on the City Nature Challenge, new staff, and notable California Naturalists. Subscribe to future newsletters here. California Naturalist climate stories are live! Check out this map! The California Climate Stories show why action on the ground is important, and how local action fits within broader efforts to adapt to climate change throughout the state. Developed for the Governor’s OPR Adaptation Clearinghouse in collaboration with UC ANR, California Naturalist, and IGIS Statewide programs. Thanks to all who shared their story! Check out our new Partner Story Map: find a class or an organization near you! Download this California Naturalist Handbook flier for 30% off from the publisher, UC Press!